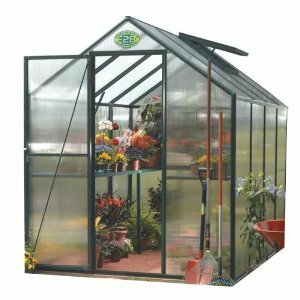 Who amongst us hasn't dreamed of having our own greenhouses full of lush green vegetation? Steamy, warm places where we could grow vegetables and flowers all year long and laugh at the winter weather! As I write this, I can look out at the frozen, snow covered garden and only dream…. Cold frames are the poor man's mini-greenhouse. As the name implies, they are usually frames set on the ground with a cover that lets in the light. Since they are unheated, their use is generally limited to starting plants that will tolerate colder temperatures or hardening off plants that have been started indoors. Construction can be simple or involved. Many people use scavenged windows or doors for the top of their cold frames. The frames are usually made to fit whatever they are using for the top and are from recycled materials as well. Material for the sides can be plywood, treated lumber, or any flat material such as Styrofoam that can support the cover. Straw bales will work well and they provide some extra insulation as well. Naturally, some of these materials will last longer than others when exposed to the elements. Covers can be made from clear plastic sheeting (drop cloths) that will last a season or two depending on the thickness and quality of the plastic. Also you can find clear corrugated plastic panels and ones made of Lexan, a strong polycarbonate plastic that many newer ones are made of. Glass is not recommended for constructing a new cold frame cover, due to the weight and breakage factors, but if you can recycle some, by all means do it, but be careful- older glass tends to break easier than new. Ventilation is important on sunny days, even when it's still chilly outside. There are inexpensive devices available that will automatically raise the lid for you when it gets too hot inside the cold frame. They come in all shapes and sizes- from the grand "Glass House" conservatories to a small frame covered with light plastic. They can be free-standing or stand alone, heated or unheated. The issues with these garden tools are cost and space. Most of us don’t have space for even a small 8’x10’ one and the cost quickly gets up to $1,000 or more. As with the cold frames you can build a greenhouse yourself using as much new or recycled material as you wish. There are tons of plans on the internet for them. The video above shows the construction of a small greenhouse based on plans from the North Carolina Cooperative Extension Service. Below are links for places that furnish some of the more unusual PVC fittings that you usually won’t find at the hardware store.